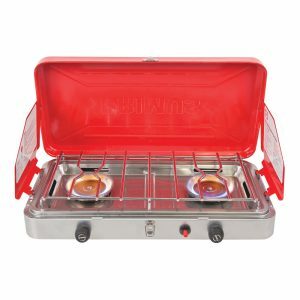 Outback Review has reviewed the most popular camping stoves available in Australia. 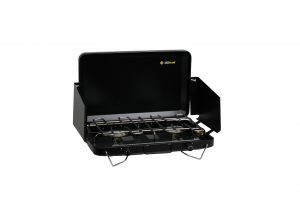 We have focused our review on the 2 burner camping stoves, however, there also a number of single or 3 burner varieties out there in the market depending on your needs. 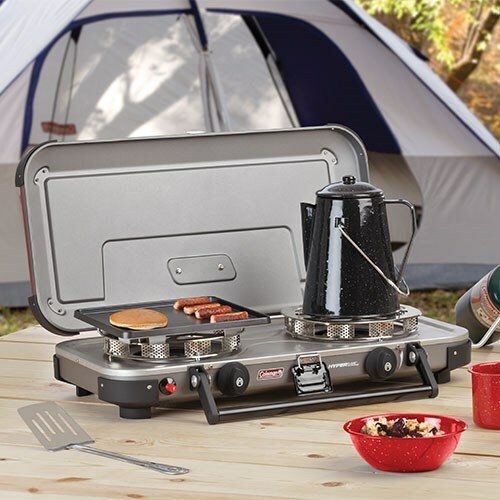 When buying a 2-burner gas camping stove you want to ensure that it is compatible with your gas bottle as most use a 3/8” gas connector. 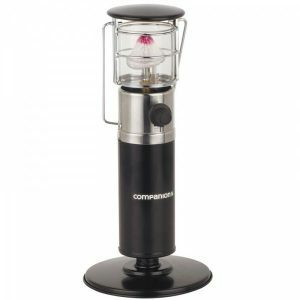 Most camping stoves sell for between $50 and $150 AUD depending on the brand, size and features. 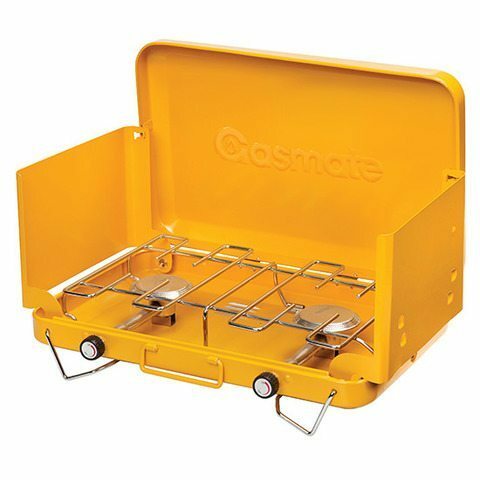 These larger gas cookers are generally considered safer than the Portable butane stove cookers that have seen some products banned in various states across Australia due to safety concerns. Our review focused on the top 2 burner camping stoves currently available on the Australian market. 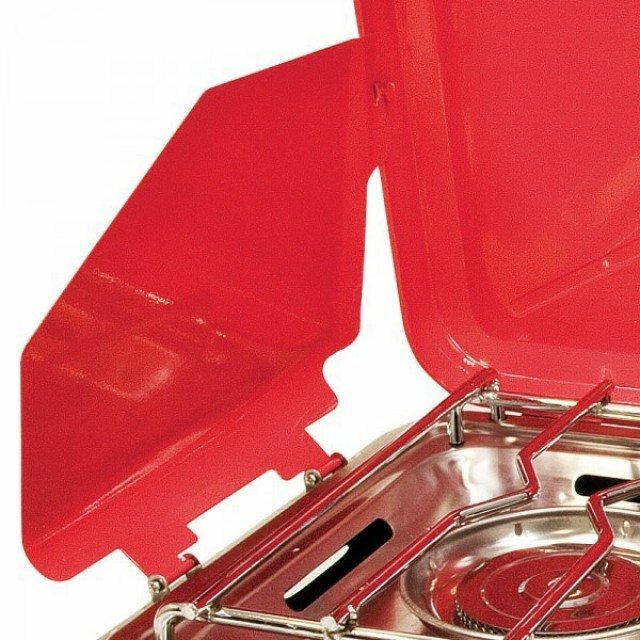 Check back for a follow-up article on 3 burner gas cookers. The Primus 2 burner high output stove is one of the hottest stoves on the market with 25,000 BTU output burners (twice that of the Gasmate model). In addition, its larger size makes it perfect for those who are serious cooker and want to cook two large pots or pans at the same time. This high-quality stove has a piezo ignition meaning you don’t need to also carry matches or a lighter. The larger size of this cooker comes at a cost in terms of size and weight and therefore this model is recommended for those seasoned travellers who have sufficient space and don’t have weight restrictions. 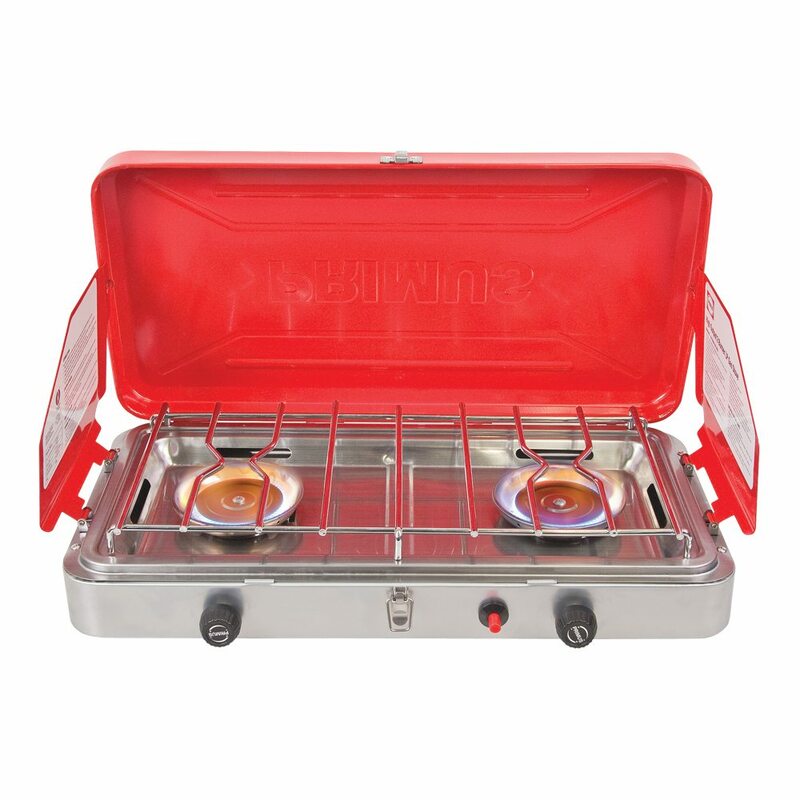 Like most other 2 burner camping stoves on the market, the Primus 2 burner high output stove comes with side walls to provide additional shelter, a drip tray for any runoff and a 3/8 BPS LH connection to a gas bottle. This model is slightly more expensive; however, the additional features and high output still mean this a great option for those who require a larger sized cooker. The Gasmate classic two burner stove is a great entry level cooker perfect for those who require additional projection for the cooker when travelling. When folded up its sturdy outer case provides great protection when stored at home or while on the move and the whole unit only weighs 3.9kg. 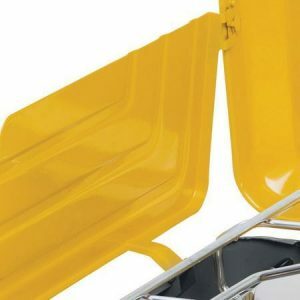 The body is powder coated to prevent scratches and it also comes with a handy carry handle. 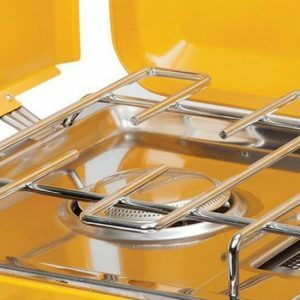 The thing we really like about the Gasmate Classic is the windshields on the back and two sides that provide protection from the wind and prevent pots and pans from sliding off the trivets. You will need to purchase a camping gas bottle as well and ensure that it is compatible with 3/8” hose that comes with cooker. This cooker is relatively efficient and consumes 195 g/h per burner per hour. The companion double burner Wok cooker is great for those cooking in large fry pans or woks. 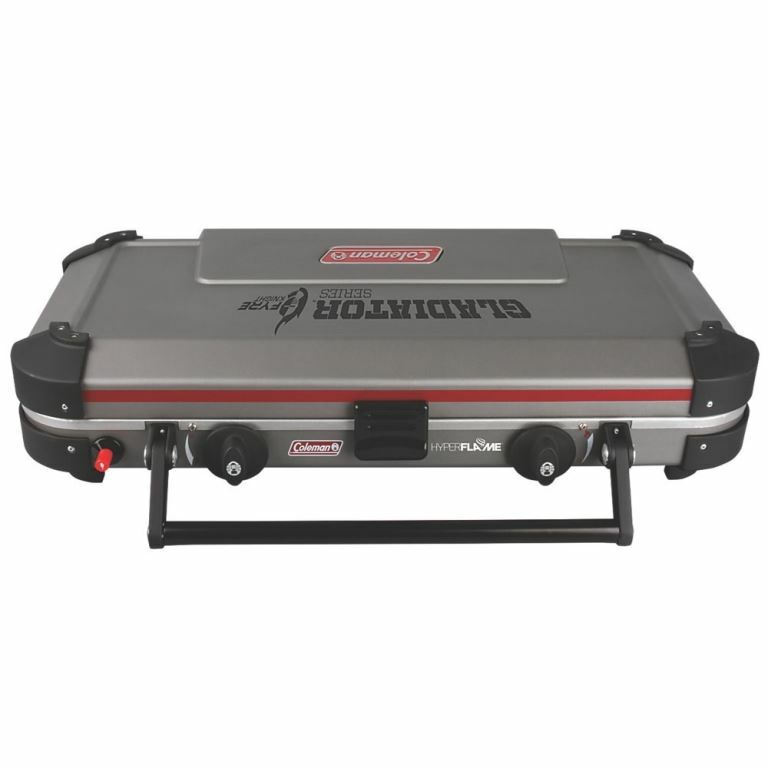 Unlike most 2 burner cookers, this has a high-quality stainless steel finish and a ¼” BSP hose connection. This model is mid-range in terms of heat output with up to 13,000 BTU and a fuel consumption of 655 g/hr. 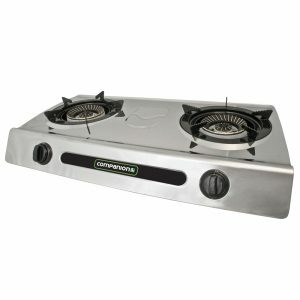 The Companion Double Burner cooker is one of the heaviest cookers on the market with a weight of 6.5kg. As this cooker does not come with wind protection, we recommend this for those who are planning to cook in sheltered conditions. It is important to ensure that the table or support is suitable to support the weight of the cooker and what is in the pots and pans being cooked. 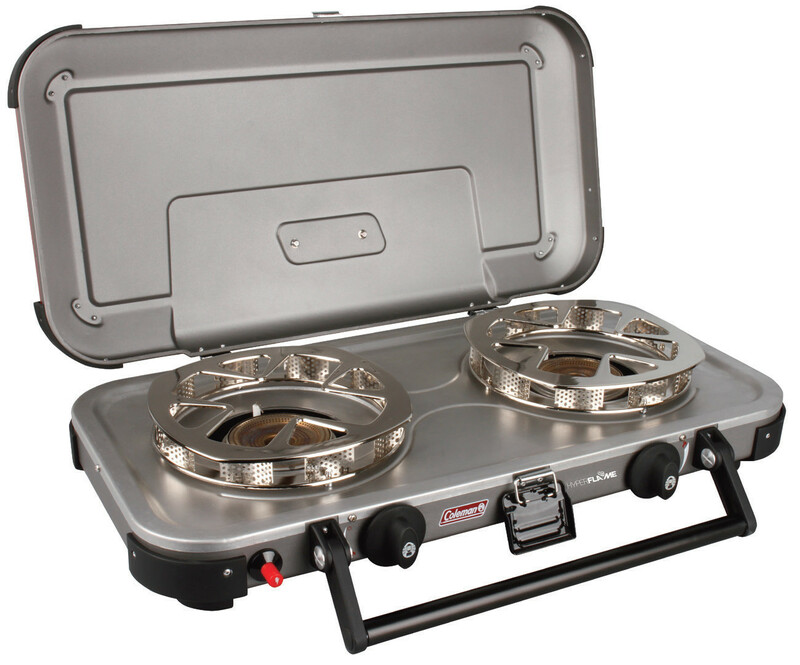 The Coleman Hyperflame FyreKnight two burner camping stove that is perfect for the more serious cookers. 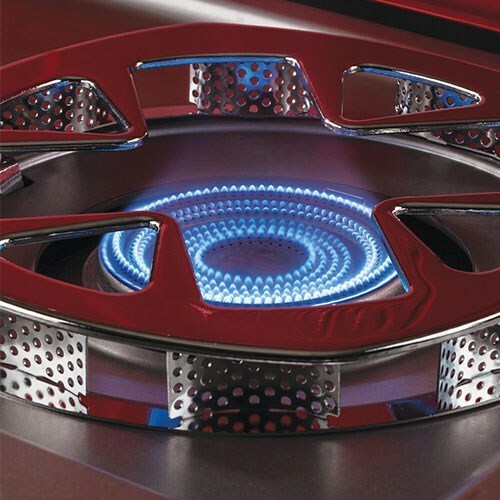 Its unique technology allows it to provide maximum heat as quickly as possible and Coleman claim it will boil water twice as fast as a normal cooker with an output of 12,000 BTU’s per hob (a total of 24,000 BTU's). Other great benefits of this cooker include its ability to hold two 30 cm pots at the same time, a non-slip mat and importantly it can use both a propane bottle and traditional LPG bottle. The only downside of this cooker is its weight as it comes in at a total of 7.1 kg making it a heavy piece of kit. 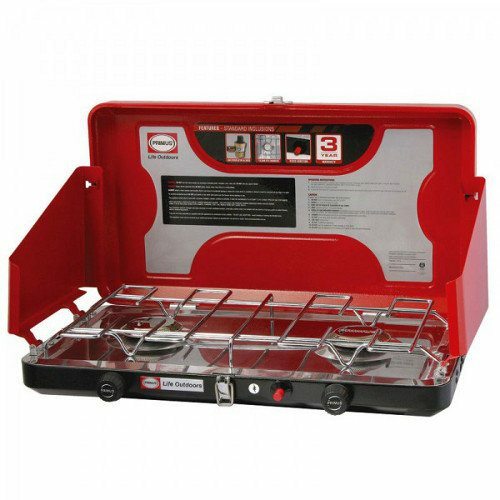 The Oztrail two burner gas stove is a basic/entry level camping stove that does not have the same level of features of some of the other competitors on the Australian market. 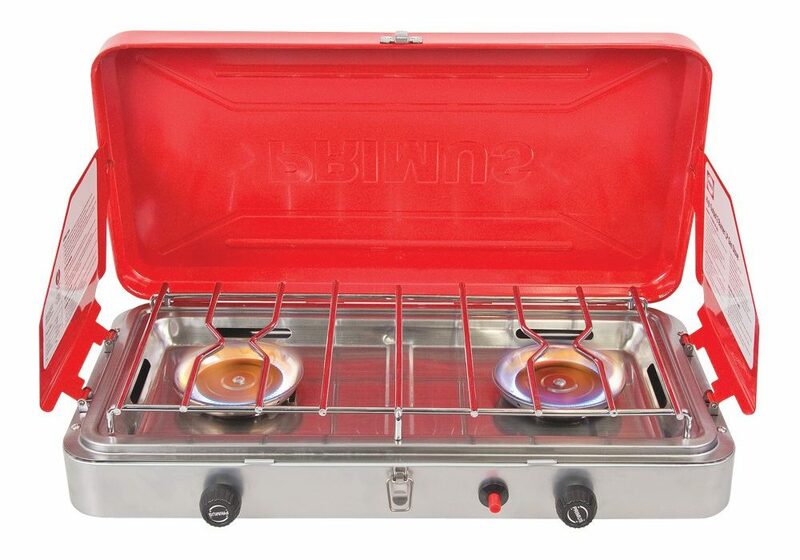 It has two 11,000 BTU burners giving it a good output of heat and side walls similar to the Coleman and Primus models. The black finish makes it easy to clean and with a weight of 4.4kg, it is easy to transport and carry.